Anterior cervical discectomy and fusion (ACDF) is a surgical spinal treatment used to remove a degenerative or herniated disc in the neck. This procedure that is done through an incision made in the front of the neck is meant to alleviate pressure on the nerve root or spinal cord in order to relieve pain and other associated symptoms. There are several steps to the operation, but it has proven to be a safe and effective means of symptom relief when non-surgical treatments are unsuccessful. Dr. Gravori and his team’s expertise in anterior cervical discectomy and fusion surgery makes ProMedSPINE the best choice for patients with cervical disc problems. What Is the ACDF Surgical Procedure? ACDF surgery involves the removal and replacement of a damaged disc. With certain spinal conditions, a disc can become damaged and begin to cause problems. Discs are located in between the vertebrae and act as a form of shock-absorbers for the spine. When these discs begin to deteriorate or become damaged, they can no longer serve their function. Bone spurs can also form and give rise to nerve irritation and compression. These situations can become very painful for a patient. Discs can also rupture, or herniate, and protrude out. When this happens, the herniated disc can push against and apply pressure to the spinal cord or nerves, causing pain and other symptoms. The ACDF procedure is done to eliminate the negative effect these compromised discs have on the spinal cord and nerves. How Is this Fusion Surgery Performed? Incision is made – A small incision is made at the front of the neck. The surgeon will basically move aside the trachea, esophagus, and muscles to have complete access to the spine. 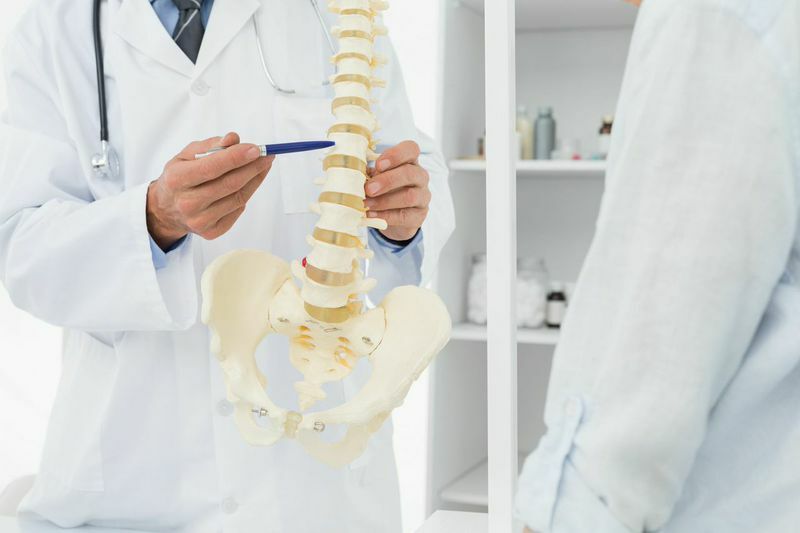 The spine surgical procedure is done through the front rather than the back so the surgeon does not have to disturb the spinal cord and nerves. Disc is removed – The correct area of the spine is verified with an X-Ray and then the disc is removed. This procedure usually necessitates the removal of only a portion of the disc, leaving some unaffected parts of the disc intact. Decompression of spinal canal – The section through which the spinal nerves travel is known as the intervertebral foramen. The foramen is enlarged using a drill in order to give the nerves more space to exit the spinal canal. Fusion – A cervical fusion is commonly done as part of the procedure. A bone graft is inserted into the area of the removed disc in order to maintain function and proper support, as well as to avoid potential spine deformities. The bone graft is meant to heal (fuse) the two vertebrae together, making them one. In some cases, an artificial disc may be used instead of fusion. Read more about the ACDF procedure on Wikipedia.com. When is ACDF Surgery Required? ACDF can be helpful in treating cervical spine conditions that require surgery. However, more conservative, non-surgical treatments should always be attempted before electing to undergo a spinal surgical procedure. At ProMedSPINE, our team of back specialists will always consider surgery as the last available option for treatment. Patients will usually be on their way home the same day of an ACDF surgery. Depending on the case and fusion, it may take up to a year and a half for the fusion to properly and fully heal. Patients will participate in a rehabilitation program designed to facilitate recovery and bone growth. Since the bone graft takes time to heal, it is important to discuss desired activity levels and timeline with the surgeon. There are specific instructions that are to be followed following spinal surgical treatment that detail the recovery process. For example, non-steroidal anti-inflammatory medications like ibuprofen are to be avoided for 6 months following surgery as they may cause bleeding and can interfere with proper bone growth. Smoking and the use of tobacco products should be drastically limited or ceased. It is advised that smokers quit before undergoing this procedure, as the nicotine in tobacco has been found to interfere with bone healing and can greatly increase the odds of a failed graft. It is important that you raise any questions you may have and to discuss any possible concerns before and after surgery. If you are interested in learning more about anterior cervical discectomy and fusion surgery for cervical spine conditions in Los Angeles, contact us today. Todd Gravori, MD, Director of ProMedSPINE, and his team are board-certified neurosurgeons with fellowship training in advanced spine surgery. At ProMedSPINE, we offer the most sophisticated technology and cutting-edge minimally invasive spine procedures to provide the highest level of care for our patients. Please contact us today to schedule an initial consultation with one of our expert surgeons. Next, please read about spinal decompression therapy.